There are many types of wedding ceremonies, and many couples aren’t really sure just what type of ceremony they actually want. Although this isn’t something that must be decided upon immediately, it is something to discuss when you are interviewing officiants. 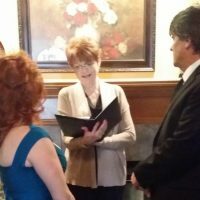 Some officiants may only do religious weddings, some may only do secular weddings, and then there are officiants that will do all types of ceremonies. La Donna Weddings is in the ALL category. We offer civil or secular, spiritual, inter-faith, basically most any type of ceremony, to any couple that is in love and wants to be married. We are glad to help you, and all couples, determine what type of ceremony is the right fit for you and what you would like included in your ceremony. The following are the most common types of ceremonies. If you have something else in mind, we would be very happy to work with you to create the ceremony you desire, and it would be an honor to be part of your special day. This type of ceremony is for those who choose not to include any religious elements to their ceremony. The ceremony is created around the couple being wed, their values, and their personal feelings, which are expressed by the script selections they choose. 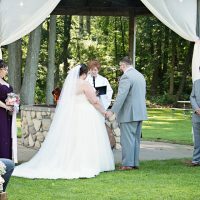 The reading of a love poem would make a nice addition to this type of ceremony, as well as many others from our list of Ceremony Enhancements. A spiritual ceremony may include religious references or not. One can be spiritual without being religious. Spirituality may be added to any ceremony by the inclusion of a prayer, scripture reading, poem or by choosing selections from our Creating Your Ceremony workbook that reference God or a ‘higher power’. The script would be based primarily on marriage and the love a couple has for each other. Personal inclusions are encouraged. Making a selection from Ceremony Enhancements would also add a personal touch. This type of ceremony would be for a couple of different faiths. Actually any of our ceremonies may be used by inter-faith couples. You may blend parts of the ceremony to create one that is custom-fit just for you. If either of the couple being married has certain religious, ethnic or cultural elements that they would like included, we welcome that. Rituals that are personal to the couple make for a more meaningful ceremony. Additional Ceremony Enhancements may be added to this type of ceremony. Our non-denominational religious ceremonies use traditional Christian scripts that are used in churches. If you want something more contemporary, that is also available. There are religious references included in this type of ceremony, or feel free to provide something of your choosing. Various wording samples are available and personal alterations are encouraged. Additional Ceremony Enhancements may also be added to this type of ceremony. This type of ceremony would primarily be for a couple wanting to get married without all of the traditional wedding fanfare. Two witnesses at least 18 years of age are required. If you do not have witnesses they can be arranged for a nominal fee. Pre-written scripts are available for you to choose your ceremony from. Just because your ceremony is small in size, doesn’t mean it shouldn’t be personal and meaningful. A personalized vow renewal ceremony is a special way to celebrate the life a couple has had together. It may be for a milestone anniversary such as the 25th or 50th, although a vow renewal may be whenever, and as often as, a couple chooses. Sometimes one spouse will surprise the other with a special ceremony in front of their family and friends.